Maggie is delighted to be making her Vermont Stage debut. She has performed with area theaters since moving to Vermont in 1996. 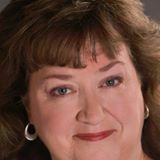 Favorite roles include Lies & Legends: The Musical Stories of Harry Chapin with Lost Nation Theater; Glinda The Good Witch/Auntie Em, The Wizard of Oz with Quarryworks Theater; and Queen of the Fairies, Iolanthe at Unadilla Theater. She sings with Montpelier Community Gospel Choir and is a perpetual seeker of spiritual truth and chocolate.